Soulful call and response singing, masterful improvisation, traditional Senegalese and Scottish dancing and incredible energy make every Soulsha show an unforgettable live experience. Intricate rhythms, soaring bagpipe melodies, and New Orleans-infused horn lines come together seamlessly, and the joy of music rises above all differences, reminding us that we’re all in this together. The band formed through a series of serendipitous meetings in the thriving and intersecting multicultural melting pot of Boston. Many of the members are virtuosic and highly esteemed tradition bearers in their styles. In Soulsha, they saw a chance to bridge divides. The music they’ve created is a conversation between cultures that breaks down all the boundaries, moving the audience to abandon their assumptions as they lose themselves on the dance floor. Soulsha will delight lovers of everything from jam bands to bluegrass. While it shares obvious roots with Afro-Celt Sound System’s electronic fusion, the funk-inspired sound of Soulsha puts tradition and interchange center stage, bringing the party energy of Rebirth Brass Band, and the cultural gravitas of masters like Malian Toumani Diabaté. The sound is fun but deep, fresh but familiar, immigrant and yet deeply American. 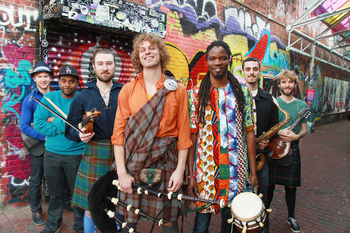 For several years, Soulsha has been developing their sound while bringing audiences to their feet at a string of northeastern US festivals including Outside the Box Boston, Tartan Day New York City, South Hadley Falls Fest, Wake Up the Earth, Glasgow Lands Highland Games and Boston Celtic Music Festival. Now they are ready to take the party further afield. Look out 2018, here comes AfroCeltic funk Nation!